I'm a writer. Before I became a writer, I was a reader. Through the years, I've read a lot of books, thousands, maybe even tens of thousands. My nonfiction genre of choice is esoteric (if that is a genre) from The Bible to Lao Tzu and all points in between. In fiction, I like drama with heavy emphasis on detective series. In late 2013 and early 2014, I wrote four blog posts that I called The Philosophy of Travis McGee #1, #2, #3, and #4 (Here's a link to all four). So, that was number one in what will be at least a 21 blog series. What do you think? Few people showed any interest, and, using that as the reason, I only wrote 4 blogs before discontinuing the series. Frankly, I was shocked when I read that. I'm a lot of things but quitter isn't one of them. I was mulling over that contradiction and wondering what to do about it about when I got an idea - just finish the series. Start now. Write "The Philosophy of Travis McGee #5" right now and go from there. My next idea was start with a philosophic quote from the 5th book, A Deadly Shade of Gold. So I reloaded the book on my Kindle and began rereading book number 5 and quickly came to my first highlight (page 8). "A McGee never gives up." If I still needed a sign (and I didn't) there it was. So here we go again. 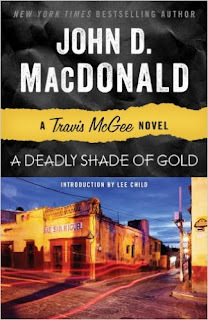 When I go to Amazon.com to get the link to the book I notice, as I do every time I go for one of the McGee books, I note that following the title of the book is this statement: John D. MacDonald Author - Lee Child Introduction. However, I will add, if that's what it takes to get the Travis McGee series back in circulation, so be it - hell, I can skip the introduction. 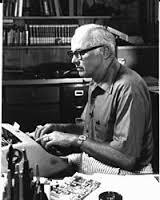 It took Travis McGee a long time to show up for John D., who published his first novel, The Brass Cupcake, in 1950. In 1964, he published The Deep Blue Goodbye, the first of 21 Travis McGee novels that were published over a twenty year period. "We are doing something wrong. We haven't found out what it is yet. But somehow we have turned all these big glossy universities into places which the thinking young ones, the mavericks, the ones we need the most, cannot endure. So all the campuses are in the hands of the unaware, the incurably, unconsciously second class kids with second class minds and that ineffably second class goal of reasonable competence, reasonable security, reasonable happiness. Perhaps this is the proper end product to populate a second class world. All mavericks ever do, anyway, is make the sane, normal, industrious people feel uncomfortable. They ask the wrong questions. Such as - What is the meaning of all of this? So weed them out. They are cultural mistakes. Leave the world to the heroes and the semi-heroes, and their rumpy little soft-eyed girls, racing like lemmings toward the warm sea of the Totally Adjusted Community." That's #5 in The Philosophy of Travis McGee Series - there are at least 16 more coming and each will have at least one timely observation from Travis himself. Your comments are both welcome and appreciated.